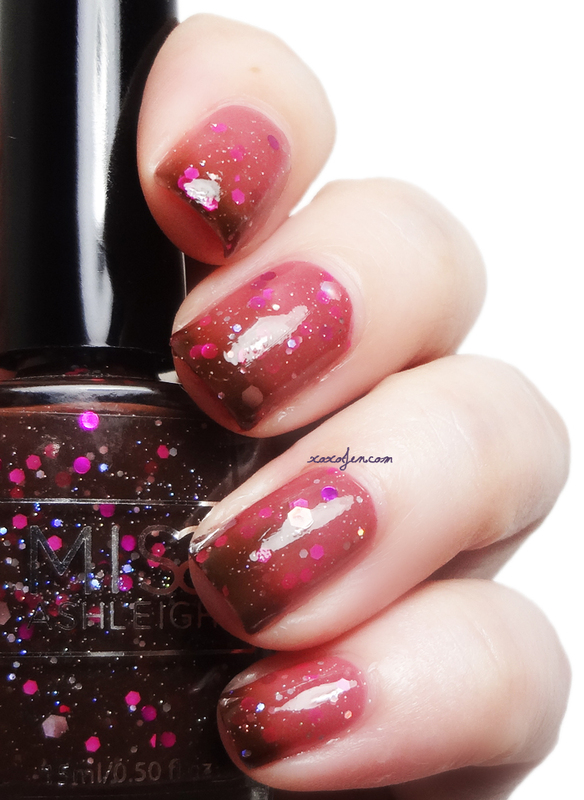 I have really enjoyed each and every Miss Ashleigh polish I've tried, and Punk Princess is no exception. It's a thermal with circle and hex glitters in it! I haven't worn thermals much so I found this to be a really fun polish to wear. I couldn't stop dunking my fingers in cold water and then watching the polish morph as it warmed up. Punk Princess changes from a pink shade when warm to a brown shade when cool. Totally makes me think of chocolate covered strawberries! The formula was amazingly smooth and easy to control. I wore two coats for opacity. Do you love this like I do? You'll be even happier to know that this polish is on sale right now for only $5 at Ella Ann Cosmetics! You can get this and a variety of other Miss Ashleigh polishes at Ella Ann Cosmetics or direct from Miss Ashleigh.